In November, 2018, an intrepid group of volunteers gathered round the #skills-framework channel in the ResearchOps Community slack group. Our aim was simple: create a researcher skills framework, helping researchers grow and charting the boundaries of research and operations. Four months later, it’s not yet a framework, but a workshop that emerges… and soon, it’s going global. 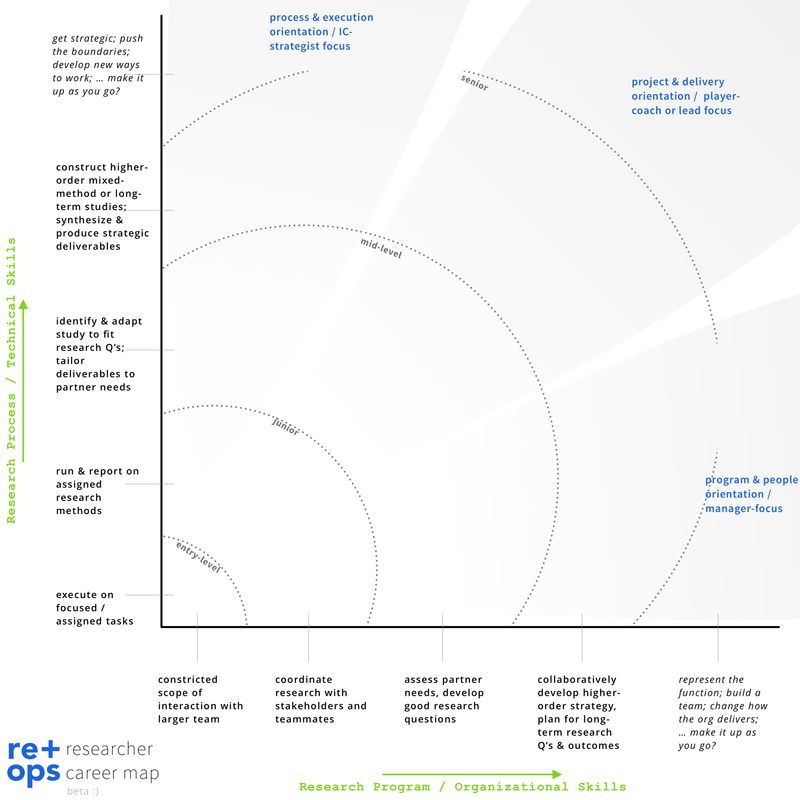 The ResearchOps Community ‘Researcher skills & career workshop’ is in beta testing. Volunteers in London, Paris, Tokyo, Denver, Seattle, and San Francisco are running the prototype “workshop in a box” with researchers and research-minded designers—right now. Soon, you’ll see a call for volunteers around the world to run this workshop in your local communities during from April – June, 2019. It’s often a researcher lead, or a research leader who brings ‘operations’ into play. That means they’re likely working with a team of researchers who they need to support from a craft-and-soft-skills perspective, as well as understanding how to provide operational support for repeatable elements of the work. Our workshop aims to help draw out the nature of researchers’ current work, and the major challenges they face as professionals, and from an operational standpoint. This post outlines three things— (1) The project that got us here and its course-shift that led to the creation of a workshop. (2) A high-level look at insights and findings from researching researchers and evaluating skill frameworks. (3) A look at the workshop we’re currently testing, and that we hope you’ll join (or run!) over the next few months. If you’re one for spoilers, go ahead and take a look at the beta workshop package (google folder)—everything here is Creative Commons so you can take, tack on, and modify as you please. Early November, 2018— Our team was assembled of 10 volunteers in the ResearchOps Community, and we kicked off with a video call, nearly all hands on deck. The high level goal was simple: “Produce a framework for researchers to level up professionally.” But what does it mean to produce a useful skills framework? Something agnostic to company-and-culture, that could help researchers everywhere learn and grow? Mid-November, 2018— We broke the project into two workstreams: 1a. Researcher Discovery, led by Vidhya, and 1b. Framework Analysis, led by Tomomi. The team split up into these two workgroups based on interest and availability. We had to learn about researchers across a number of geographies, contexts-of-work, and seniorities... and about the current work these researchers engaged in, the way they perceived their skills & career progress, their understanding and ambitions for growth, and the major challenges they faced day-to-day. And so the Discovery workstream had its charter. And, if we were going to build a useful framework… we’d have to get a handle on what frameworks were out there, how they were used in practice. Ultimately, we needed to figure out the type of structures that would help researchers learn and grow. And the Framework workstream had its charter. Mid-December, 2018— We re-grouped in Mid-December, taking a look at the two workstreams. We were behind on our initial timelines. Not surprising for a volunteer-run project: personal and family events come up, work and careers shift; the time we aspire to spend on this type of work doesn’t always equate to the time we can. Nonetheless, progress: we’d run distributed interviews with 16 researchers and research managers. We had collected over 17 frameworks, reading, reviewing, and assessing their relevance to our future-framework. So we broke for the holidays, with the goal of completing a higher-order synthesis in each workstream by early January, then consolidating and reorienting by the 25th. Mid-January, 2019— The work was in, and the project was getting harder to move. A few reflections: it’s difficult to generate shared understanding for a volunteer, distributed team. While the ideal, physical Chipchase- or Kolko-inspired data wall would be impractical, we missed an opportunity to set up a digital equivalent in Mural or RealtimeBoard where the team could “live with” the data. And without predefined check-in cadence or scheduled face-to-face time for our team, psychological distance increased. Ad-hoc coordination in a private Slack channel will only get you so far. And then a spark: an insight from Will illuminated the power of this work as our interviewees gained new perspective—nearly cathartic—through the act of being interviewed about the work. Could any framework, be it a matrix, a map, or some other model, really effect such a good outcome? Tomomi added her perspective: we’d seen and learned quite a bit through the work… would our 16–20 interviews really give us enough to build a strong and widely-usful framework? How might we build a set of useful, open-source data that would let us deeply model out our work, challenges, edges? What if we could capture the useful magic of the interviews, and built out workshops like the initial What Is ResearchOps series? These two ideas set us down a new path, and helped us answer a very useful question that Vidhya asked as we we were going forward—is what we need for this work really one more framework? Perhaps not. At least not immediately. We decided to see if we could translate our effort so far into a workshop. I stated to sketch out an outline for a “workshop in a box,” with guidance and feedback from the team and members of the public #skills-framework slack channel. Mid-February, 2018— Around the middle of February, we had something. A fairly clear shape for a workshop; a set of activities we believed would provoke the same useful reflection our interviews did; and a way of introducing craft- and soft-skills to attendees that would help the community collect data on what-it-is-we-really-do, and our challenges and aspirations for growth. We were able to coordinate test-workshops within our team and with a little support in London (thank you, Suki! ), targeting for the first three weeks of March. March, 2018 (now)— It’s really happening. One beta test is complete as I write, and 4 more are scheduled over the next 2 weeks. We’re sorting out what it means to operationalize the workshop in a box as a global workshop series: calls for organizers, workshop instructions & briefings, event description, workshop-tracking mechanism, and those other unknown unknowns that are yet to come up. Discovery Workstream— All the researchers we spoke with were interested in building their influence to advance research practice & mindset in their organization—but that doesn’t mean they know how to do it, or what it looks like when it’s working well. Junior researchers had a hard time understanding the line between various disciplines—especially with respect to product management. Along with Mid-level researchers, both groups were looking to understand how the organization delivers and to build out the skills required to actually create impact through their work. In the workshop, we’ll open threads of craft skills, soft skills, and push researchers to start building useful pictures of the projects & organizations. The Senior researchers we spoke with had overcome these hurdles… and as a reward felt continually stretched thin. Good researchers always have more work available than they can realistically accomplish well, but not all of them have managers&leaders who can help them prioritize and protect their time. Even with a stronger understanding of their capacities and career trajectories, the senior researchers we spoke with found it difficult to take time to step back, evaluate, and make real plans going forward. Framework Workstream— Reviewing almost to 20 skill-or-career frameworks we found that most of the progression frameworks that exist within organizations are developed for the sake of administrative legibility. That is, they don’t exist for the researchers but for the sake of putting people into buckets for promotions and salary banding. Understanding how to measure peoples’ progress and assign pay are important tools for organizations; but it’s rare this type of framework is instructive, especially if in a pure spreadsheet or text-matrix format. We found that a visual mapping was an extremely effective element in understanding career-or-skills growth and progress. We loved seeing Jason Mesut’s approach to creating the Shapes of UX Designer—and realized that we first need to better draw out the full breadth of raw skills (craft, soft) at play in research and research operations before we can start talking about Shapes of a Researcher. In our workshop, Worksheet #1 and Worksheet #2 will ask attendees to identify craft skills they use day-to-day, include the ones we’ve missed, and identify their current state across range of softer skills and sensibilities. From a career-track perspective, we found Siva Sabaretnam’s Designing a Better Career Path for Designers (image above) a wonderful way to show the range of career options that aren’t just “become a manager.” We believe a similar course exists in research, and want our attendees to find out for themselves. Worksheet #3 in the workshop is a similar map that researchers can use to chart their progress, and project to what might be next. It’s a basic research practice: where we can’t observe real behavior in context, we try to work with a specific, concrete instance of recent past behavior. 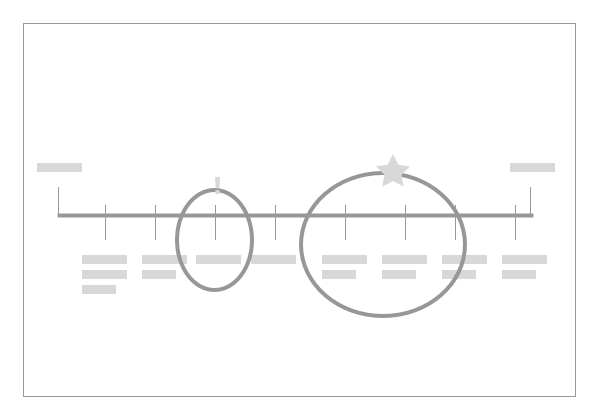 Part 1: Mapping & Exploration — The workshop aims to create this concrete instance by asking participants to draw out their team and its structure (Activity 1) for context, and then the timeline of a recent project (Activity 2). These are of activities you might run in-depth for hours apiece with a team—which is a lovely idea, and not entirely feasible for volunteer-run community workshops. So we move through these activities quickly, identifying a specific context, helping researchers identify blind spots, and setting the stage for reflecting on the craft and soft-skills they use in the work. Part 2: Rating & Reflection— We start with two skills-sheet and a map. In light of the recent projects, researchers will sort through an array of craft skills (generated from our Discovery interviews), rate themselves on a series of soft-skill-spectra (pulled from Discovery interviews and Framework analysis), and then zoom out one level higher, charting the course of their career as-informed by the skills & sensibilities they use day-to-day. This last map (see article header image) asks attendees to look at the past, consider their current trajectory, and project ahead into a new range of career possibilities. And on these sets of skills + map, we wind down with small-group discussion. Like our Discovery workstream interviews, a workshop offers a chance to interpret and articulate the work for other people who will understand the challenge, find the fuzzy edges, and push us for clarity. Unlike remote interviews, we hope the local character of the workshop allows for attendees to meet one another and continue the discussion outside the workshop, helping one another grow professionally. The close (& data collection)— After drawing, sorting, rating, reflecting, mapping, and discussing… the final phase is a coalescing bit of personal reflection, and data-gathering. Printed worksheets help participants summarize what they’ve worked through, identify challenges, focus on a goal. The tangible artifact keeps the focus on the workshop material itself, rather than asking participants to get on a screen before wrapping up. And the worksheets match 1:1 a digital data-collection form. We’ll ask attendees to take a picture of their summary worksheet (no PII is collected) and leave it with the organizer. Our intrepid organizers will have a chance to learn from each attendee as they spend a couple minutes reviewing each summary as they fill out the collection form, sending data back ResearchOps community HQ. We open-source all collected data and, more importantly… lay out the groundwork for the best, greatest, and most useful researcher skills frameworks ever to be created. Right now (March 2019) we’re getting the Call for Organizers ready. One beta test is complete and the rest of our cities are underway. We’re all very excited—to make it work, and to connect researchers everywhere to help them grow. The target is to get organizers up and running in April, and support all global workshops with guidance, love, and labor through the month of June. We’d love to hear your thoughts in #skills-framework on Slack, or please do sign up for a community invite if you haven’t already. And of course—a huge thank you to the team of volunteers who made it all happen!